If you are thinking of joining the United States Military, you will have to take a fitness test to enter, as well as every six months once you have completed your basic training and are serving in your military job. There are five branches of the military — each with similar but different fitness tests and standards. There are also many ways to join as an officer or enlisted personnel. Below is the list of the regular military fitness tests and the basic requirements for new recruits and officers seeking entrance into the military. The Marines have arguably the most difficult fitness test as it requires Marines to run an additional mile and do pull-ups. The USMC physical fitness test requirements are crunches for 2 minutes, pull-ups to the maximum repetition, and a 3-mile run. The Marines fitness testing is undergoing changes and starting to add push-ups as part of the PFT. A Marine can opt out of pull-ups and choose push-ups but only receive 70 percent of the maximum score by replacing the pull-up event with push-ups. For instance, if a new Marine maxes out the pull-ups (23), s/he will get 100 points. If the Marine maxes out the push-ups (87), the Marine only gets 70 points. The maximum score for the USMC PFT is 300. Next on the list of physical fitness test difficulty is the Army PFT. The Army PFT consists of the following exercises: 2-minutes of push-ups, 2-minutes of sit-ups, and a 2-mile timed run. In accordance with AR 350-1, soldiers have to pass the APFT by scoring at least 60 points on each event and an overall score of at least 180 points. Soldiers in Basic Combat Training (BCT) must attain 50 points in each event and an overall score of 150 points. The maximum score a Soldier can attain on the APFT is 300 points. The Navy allows it's active duty sailors to choose between the 1.5-mile run or 500yd or 450m swim in the Navy Physical Readiness Test. However, if you are attending boot camp or the Naval Academy or any Navy ROTC program, you must run as the swim is not an option until you have graduated from your basic training or officer training program. The Navy Physical Fitness Test consists of 2-minute push-ups, 2-minute sit-ups, and 1.5-mile run or 500yd/450m swim. 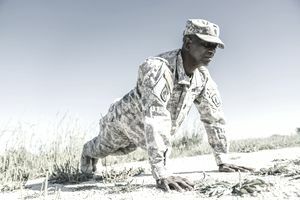 Recently overhauling their fitness standards (2013), the Air Force Physical Fitness Test requires the following exercises: push-ups 1 min, sit-ups 1 min, and a 1.5-mile timed run. Though the Air Force calls their abdominal exercise sit-ups, they are actually crunches, if you define sit-ups as placing inter-locked hands behind your head. The Air Force sit-up is the same exercise as the Navy crunch. The Coast Guard Fitness Assessment requires the member to be tested in the following events: 1 minute of push-ups, 1-minute of curl-ups or sit-ups, and a 1.5-mile run. The one minute test is one of the differences, but the option to do curl-ups (crunches) versus sit-ups (with hands cupped behind the ears) is the other difference in exercises being tested in the Coast Guard. The major difference between this fitness test and other PRTs in the military is the use of the shuttle run and the kneeling basketball throw. The good news for the multiple service academy applicant is that you only have to take the test once for any of the academies that use this test. The service academies are highly competitive and it behooves the applicant to score the maximum possible on these tests. You will see the terms sit-ups and crunches. They are similar core testing exercises but they are different how they are performed and counted. The sit-ups require the Army soldier to lock the hands behind the head and sit-up to bring the elbows to touch the knees of bent legs. The Crunch requires the sailor or airman to cross the arms over the chest and sit-up to touch the elbows to the legs (between knees/thighs). Curl-ups are synonymous with crunches. The Coast Guard sit-up option requires the hands to be cupped behind the ears instead of interlocked behind the head as in the Army. What Are the Physical Fitness Standards for Air Force Basic Training? What Are the Minimum Required ASVAB Scores for Military Branches? Can a Color-Blind Person Join the Military?